Champion Glenheath Blueprint, affectionately known at home as Oliver. 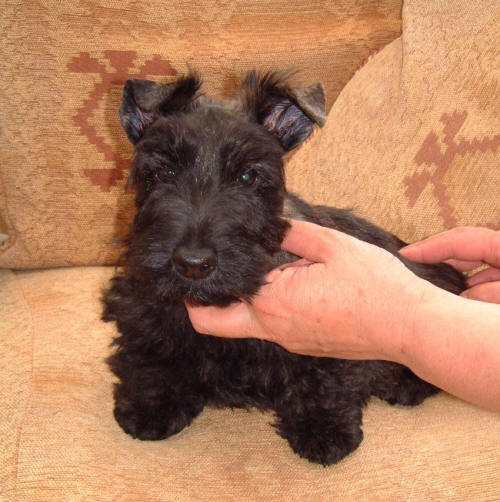 Scottish Terrier Breeders & Puppies For Sale If your a Scottish Terrier breeder and have Scottish Terrier puppies for sale, send us your details for free and we will add to our Scottish Terrier Breeders page. 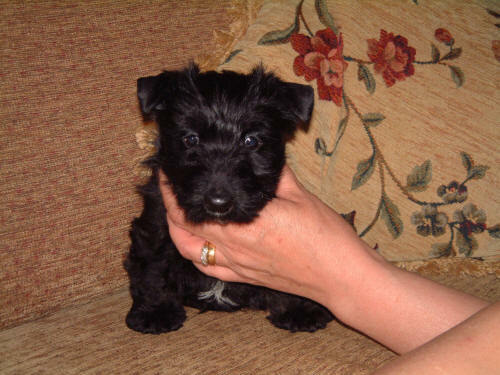 Scottish Terrier Rescue Center Visit the Scottish Terrier rescue centers if your looking to rescue a Scottish Terrier, as well as learn more about the breed or just support the rescue centers for there hard work. Origin / History Bred in the north of Scotland to kill foxes and rodents. Appearance Long flat head, dark eyes, and pointed prick ears. Colours Mostly commonly they are black in colour. Others colours are brindle or wheaten. Temperament Lively, strong willed, stubborn, independant, very loyal, highly intelligent and faithful dogs. Height and Weight 25 - 28 cm in height and 8.5 to 10.5 Kg in weight. Males and females are generally around the same size. 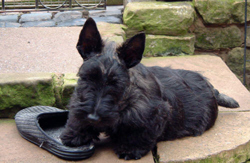 Common Health Problems A fairly healthy breed, but may suffer from Scottie Cramp, hypothyroidism, von Willebrands's disease, craniomandibular osteopathy and skin problems, allergies. Living Conditions Will do fine in country or town, even an apartment, although of course would prefer access to a securely fenced garden. Exercise Requirements An active breeds which needs a good daily walk. Will certainly enjoy longer walks if given the opportunity. Training Requirements Not an easy breed to obedience train. Need firm handling and strong leadership. Can be sensitive and like to be treated with respect. Life Expectancy 12- 15 years. 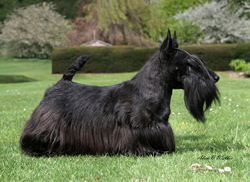 Grooming A Scottie is double coated, having a wiry outer coat and a soft dense undercoat, regular trimming is necessary to kept the classic Scottie shape as is regular grooming to avoid the coat getting tangled. The harsh dense wiry coat, which has a shot dense and soft undercoat needs a good brush a couple of times a week. Coat needs hand stripping every 3 - 4 months. CompleteDogsGuide Comment A strong willed breed. Ideal for people who lead an active life in the company of there dog. More Scottish Terrier Information: Check out our Scottish Terrier Clubs and links to more informative websites dedicated to the breed.